Churchill County Parks and Recreation is proud to offer the 2019 SUMFUN Summer Day Camp Program. SUMFUN is eleven weeks of summer day camp beginning Monday, June 3rd and ending Friday, August 16th. Camp is open to youth 6 to 12 years of age from 7:30am to 6:00pm, Monday through Friday. Each week includes a theme, snacks, games, activities, crafts, field trips and swimming. Pre-registration for each week is required (Registration begins May 1 - $85 per week, "drop in" $25 per day and there will be a one time registration fee of $15 (on first child only) which includes a SUMFUN T-shirt). 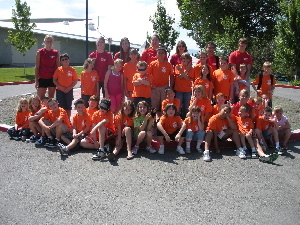 If you have any questions regarding the SUMFUN program, please contact the Parks & Recreation Office at (775) 423-7733. *A fee reduction program is available for families who qualify for assistance, Contact Churchill County Social Services. Families can pay for the entire summer upfront and avoid the hassle of weekly registration (Includes all 11 weeks, Wild Island Trips and Registration fee. This payment method saves the family over the entire summer. For more information, call the Parks and Recreation Office. We do swimming on Mondays, Wednesdays, and Fridays. If you have any questions regarding swimming please feel free to contact our office at (775) 423-7733 or the Indoor Pool at (775) 423-7091. This junior counselor program provides 13 - 14 year-olds with knowledge and skills required to be responsible counselors for youth programs. Lessons are grouped into five main areas: behaviors, response, mentoring, leadership, and professionalism. Participants receive a t-shirt, participant manual, and CPR/AED/First Aid certification. A volunteer internship as a Junior Counselor, mentored by our professional Camp Staff, will be offered during the summer for those who complete the course.